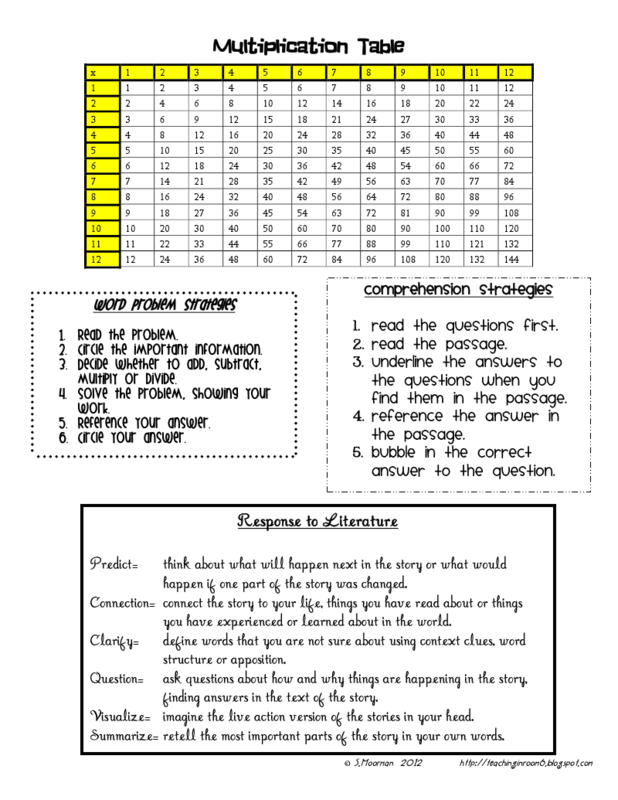 I have been taking a bit of time to work on things that I am going to be using in my classroom come August, and I thought I would share them with you. All of this is stuff you have seen before, but I thought putting all of the links in one post might be helpful. So here we go. I have been working mostly on getting things ready for the "decorating days" in my room...you know the days when you go in before the kids come in and you get everything ready? Since I am moving rooms (I know...no more room 6...I will let you in on a little secret...I wasn't in room 6 last year either. That was just my very first room ;) ) I took down all of my signs and things, so I figure I need new ones. I have made myself a new word wall for my Root words. It is SUPER simple to make. Just a set of letters, printed onto paper, then backed in black and laminated. Done and done. 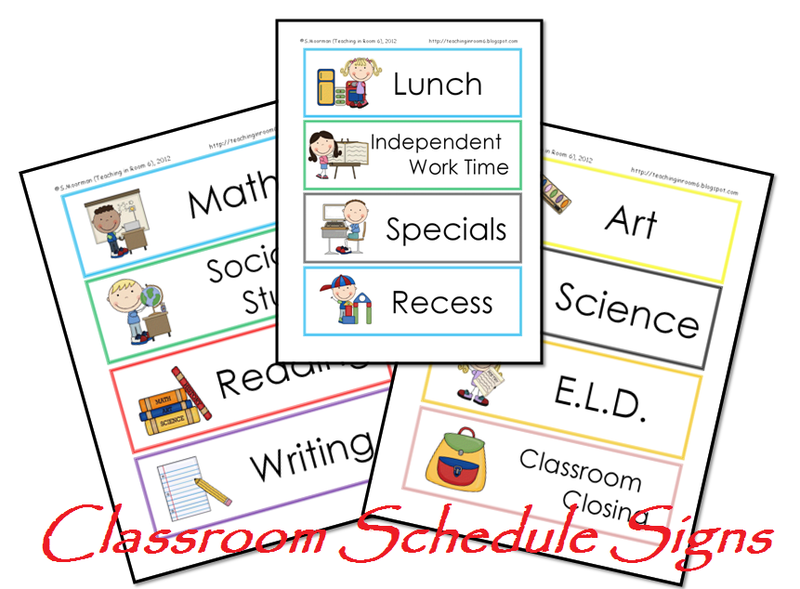 Next, I made the schedule card signs. I backed them with some "made" paper. Basically, I took a marker on a piece of white paper and started squiggling. Then I overlaid the schedule sign, cut it out, and laminated. Followed by an attached magnet. I went with simple, but if you want some cliparty ones, here is a link for some that I made. Enjoy. I have also been gluing folders together. I love rubber cement. It is so so awesome! It makes gluing SO much easier. 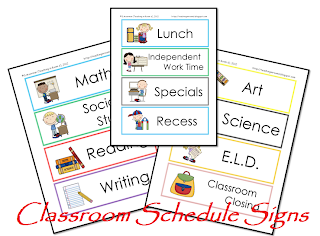 The folders are coming together nicely, and I am sure the kids will stay super organized and never lose a paper ever because of these organized folders. (can you sense the hint of sarcasm there?? ;) ) I already shared these with you, but here they are again, since that is also what I am doing this week. Of course, on the back of the Homework Folder, is going this reference sheet. 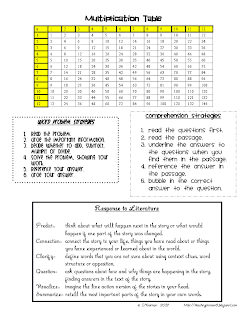 I like this one because it has the comprehension strategies on it, as well as word problem attack strategies. Since that is what I want my students focusing on during their homework time, I included those things. Here it is again for you. And of course I have been collating the copies that I made before I went off for the summer. The Math Calendar is done and stapled. So is the Welcome Back packet of information for the Homework folders. So there you have it. I know, nothing new.....but this beginning of the year stuff has to be done and since it was on my mind, I thought I would reshare the docs with you so you didn't have to search all over for them (if you were interested of course!) What have you been working on? Awesome - thanks for sharing. I love your folder covers. I downloaded thema and will use them this year. You are on a roll with your organization! Congrats! I finally feel like I am getting somewhere with my stuff. I would love to know more about how you are incorporating the root word word wall! I am needing a more streamlined approach to teaching roots all year long.... and advice would be much appreciated! I would also like to hear more about the Root Word Wall. Please share! All of the posts explain how I teach root words, including using the root word wall. Love your blog! I am giving you the One Lovely Blog Award. Pop over to my blog to learn more :) Looking forward to see what your class is up to this year. They do refer to it a lot. I am actually really happy with how the Word Wall stuff went this year. I feel like their knowledge of words was greatly increased, and doing the word wall this way really helped. Seriously though, thanks for validating that the paperwork aspect really is important... I love all the arts and crafts, and I will love decorating my room when I have access, I'm just glad someone else is doing the same type of thing as me with lots of paperwork stuff. Great job! You are amazing! Thank you so much for being willing to share the things you are doing. I LOVE your site, and have gotten so much valuable information from you. It has helped me to become a better teacher. The things you share always seem to be exactly what I need. Thanks!! I was wondering if you could help me out! I am having a discussion about your TOP 5 favorite books for middle schoolers! Come join me! That's it! Still got A LOT more to do!